Two types of sensors are available. The high-accuracy sensor (“H” model) reads temperature to ±0.125 °C over a calibrated range of 16 °C to 24 °C. Relative humidity readings are to ±1.5% RH from 20% RH to 70% RH. The standard-accuracy sensor (“S” model) reads temperature to ±0.25 °C over its calibrated range of 15 °C to 35 °C. Relative humidity readings are to ±2% RH from 20% RH to 70% RH. All DewK sensors come with NVLAP accredited certificates of calibration for both temperature and humidity, complete with data and NIST traceability. With its built-in Ethernet RJ45 jack, multiple DewKs can be monitored from the same screen using Log Ware III client-server software. Ethernet also gives you the possibility for remote connectivity over the internet, so you can monitor critical conditions while you’re away. Cables running along the floor can be a safety hazard, and cables hanging from the ceiling and walls are an eyesore. With the DewK, simply connect your computer through an RF modem up to 100 ft away, without the clutter of all the extra cables. If you need a printout, send data to a printer through the RS-232 interface in real time. 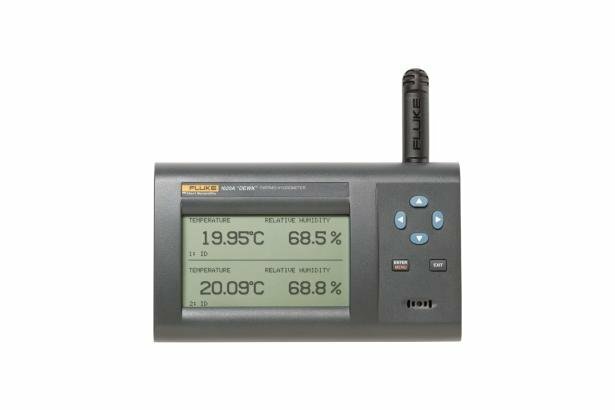 In addition to temperature and humidity, the DewK calculates dew point, heat index, and rates of change for both temperature and humidity. Min, max, and a variety of other statistics are also calculated and can be shown on-screen. Daily summary statistics, including min, max, and maximum rates of change are stored for the most recent sixty days. With inputs for two sensors, each measuring both temperature and relative humidity, one DewK can monitor two locations at the same time. Both sensors can be run via extension cables to remote locations up to 100 feet away, or one sensor can be directly mounted to the top of the DewK. Each sensor is calibrated for both temperature and humidity by Fluke Calibration. The calibration constants assigned to the sensors reside in a memory chip located inside the sensor housing, so sensors may be used interchangeably between different DewKs, and the recalibration of sensors doesn’t require an accompanying DewK. Sensors may also be assigned a unique identifier (up to 16 characters) to facilitate record keeping by matching the sensor identifier with the collected data. Each DewK ships with one sensor, with additional sensors available from. Spare sensors may also be purchased as a kit, which includes a case for the sensor, a wall mounting bracket, and a 25-foot extension cable. The DewK has enough on-board memory to store up to 400,000 date- and times stamped data points. That’s two years worth of data for both measurements from two sensors if readings are taken every ten minutes! Alarm settings can be set up quickly in the DewK based on temperature, the rate of change in temperature, RH, the rate of change in RH, and instrument fault conditions. Alarms can be both visual (flashing display) and audible (beeping). Likewise, alarm settings can be set up and events triggered in Log Ware III. The DewK is also equipped with a 0 to 12 volt alarm output that can trigger a process control system. A backup battery shuts down the DewK’s display but maintains measurements for up to 16 hours in the event of a power failure. Want to view data from across the room? 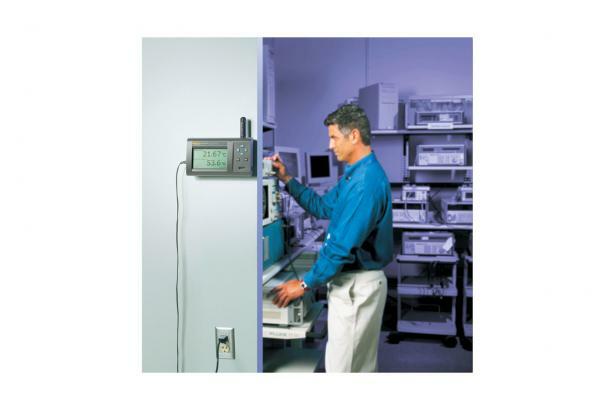 Want to view data from two temperature and two humidity inputs simultaneously? Want to view data graphically, statistically, or both? At the same time?! The DewK does everything you could want—or at least everything we could think of. Up to sixteen different display setups can be stored and recalled at the touch of a single button. And all 16 can be easily modified, so you get exactly what you want. The DewK measures temperature to ±0.125 °C and humidity to ±1.5% on two channels, and displays it on a big, clear screen. Ethernet, wireless (optional), or RS-232 will allow you to network as many DewKs as you’d like. And the Log Ware III software will allow real-time logging of multiple DewKs, data storage to your computer and seamless integration with MET/CAL® software.